Look in the Dodge lineup and you will find a powerful selection of vehicles ready to meet the demands of your life in Corpus Christi. Whether you need a family-friendly Dodge Journey or want a race-inspired Dodge Charger, you can expect impeccable performance and style from the Dodge models found at Allen Samuels CDJR Aransas Pass. 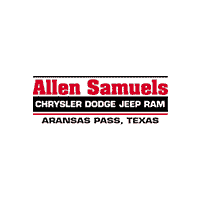 Why Buy Your Next Chrysler, Dodge, Jeep, Ram at Allen Samuels CDJR Aransas Pass? Finance Center: Our finance center is filled with experts working to provide you the best rates possible. Convenient Online Tools: Before you even make the trip over you can access online tools that will allow you to apply for financing online, value your trade-in, and customize your payment with our monthly payment calculator. Service Department: The certified technicians at our service department specialize in Chrysler, Dodge, Jeep, Ram vehicles and use genuine parts in all their repairs. Mopar® Parts: Not only do we use high-quality Mopar® Parts, but we have a parts price guarantee so you know you are getting a great deal! Vehicle Specials: Save on your new or used vehicle with the offers and incentives available at Allen Samuels CDJR Aransas Pass. To experience the Allen Samuels CDJR Aransas Pass car buying difference, and find the right Dodge model for you, visit us today in Aransas Pass!